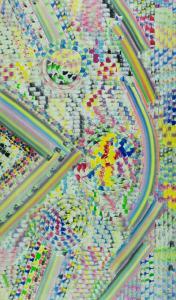 Richard Larter, often identified as the founder of Australian ‘pop’ art, was born at Hornchurch in Essex England in 1929. In 1962, he migrated to Australia where he would remain for the rest of his life, leaving a lasting impression on Australian abstract art, with his individualistic and often confrontational style. In his early years in England, Larter’s well-to-do parents had hoped their son would become a doctor, but the young Richard had other ideas. He wanted to be an artist and enrolled in classes at St Martin’s School of Art in London. These were short lived. "The place was full of squadron leaders with long moustaches drinking a great deal of beer, and it just seemed hopeless to expect to find out anything about art,”* Larter said of this brief sojourn with creativity. Next, he worked in the insurance sector but was sacked for being rude to his boss. During his brief career as a surveyor, he met Patricia Holmes and the two lived with Pat’s family on Canvey Island at the mouth of the Thames. It was during this period that Larter seriously committed himself to painting. Unfortunately, most of his work was destroyed in the “Great North Sea Flood” of January 31, 1953 and Canvey Island was evacuated. A few weeks later, Richard and Pat were married and moved to London where they studied at night classes at the Toynbee Hall in the East End, working odd jobs during the day. Inspired by a contemporary, Eduardo Paolozzi, “the father of British pop art”, Larter began experimenting with his painting. He produced smooth lines of varying thickness using a paint-filled hypodermic syringe. Later, he worked with rollers and stencils to create his effects. From 1954-57, Larter attended Shoreditch Teachers College in Surrey, then one of England's pre-eminent arts institutes. Between 1957-62 he practiced as an artist, exhibiting in Group shows in Paris, London and Moscow. In 1962, Larter applied to the NSW Education Department to migrate as a teacher. He was to spend the next 52 years enriching the Australian contemporary art scene. In Australia in the 60's and 70's, Larter became known for work that challenged the prevailing conservative values of the time. For some, his work was seen as too confronting and pornographic; for others, he was a breath of fresh air. In 1972, Larter abandoned art teaching to concentrate entirely on painting. Pat too was painting as a “Mail artist”, an underground movement involving the exchange of small-scale artworks by post. Critics complained that Larter’s output was focussed too heavily on his wife; Larter came back with a composite portrait made up of Pat in 42 different poses. As Sydney art critic Jeremy Eccles noted at the time of Larter’s death in 2014: “His works were sexually explicit, politically and socially charged embodiments of his strident anti-authoritarian stance, his pacifist views and liberated attitudes. He was passionately opposed to the Vietnam War, had a strong opposition to censorship and repression, and an absolute contempt for the moralising, censorious hypocrisy of the Idiot Society he lived in. Larter's sexually explicit “pop” inspired works were deliberately rendered to expose the double standards of the time. Graphic sexual imagery was seen as a greater taboo than depictions of violence. Some of his more political works at the time came as a result of Australia's involvement in the Vietnam War and the Whitlam Government’s dismissal. Not all of Larter’s work was based on the human figure however. He was also inspired by the landscape around him, Islamic art (particularly for its decorative patterns) and Aboriginal painting. A large part of his later oeuvre was taken up by purely abstract paintings revelling in a cacophony of colours, textures and shapes. 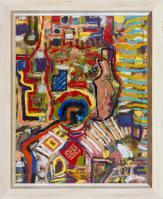 In 1996, Larter won the prestigious Clemenger Contemporary Art Award at the National Gallery of Victoria. He was given a one-man show “Stripperama” at the Heide Museum of Modern Art in 2002. In 2008, he was honoured with a Retrospective at the National Gallery of Australia. Larter was awarded the Medal of the Order of Australia for services to painting in 2011. Sadly, Pat died of lymphoma 1996 at the age of 60. Larter was devastated and moved from their studio in Yass, New South Wales, to live in Canberra, in the Australian Capital Territory. He continued his output of abstract art, though it dropped from its peak of around 400 works a year to just over 100. He died in Canberra having just reached the age of 85. Larter’s work is held in the collections of the National Gallery of Australia; National Gallery of Victoria; Art Gallery of New South Wales; Art Gallery of South Australia; Art Gallery of Western Australia; Ballarat Fine Art Gallery; and private collections throughout Australia and overseas.